I have an annual ritual. That ritual is to travel to another location for a retreat and basically refresh my mind. As you know, travel is one of the highest forms of learning. Asides learning, I meet really incredible people. We are almost in the season of love and giving and I am in a very good mood. Not only do I have a life-changing bonus for you, but I also have a proposition. Are you willing to do things differently in your business? Are you ready to be different from the crowd? Are you ready to do what it takes to be seen as credible in your industry? Are you ready to build a legacy? Are you ready to impact the lives of people you’ve destined to touch? Are you ready to get your message to the world? Don’t tell me you’re waiting for the new year to start before you decide. The people who will crush the new year have already started implementing their plans. Where do you stand? Are you an action taker or a procrastinator? Be a part of ‘Emerge’, a transformational live class for individuals who want to build a personal brand that will break down doors, eliminate barriers and open opportunities. The strategies that will be shared is all that has helped me collaborate with top shots, gotten me an international speaking engagement, endeared me to many and constantly keeps me on my feet to improve myself and my skills. We will be having exercises that will help you reach out to who you want to be, tap in and bring it to reality. We will map out actions that will help you realise that reality (there is no success without work) and that’s where goal mapping comes in. Our location will be exotic. This is very intentional as a peaceful environment has proven to be very helpful in making dreams come true. 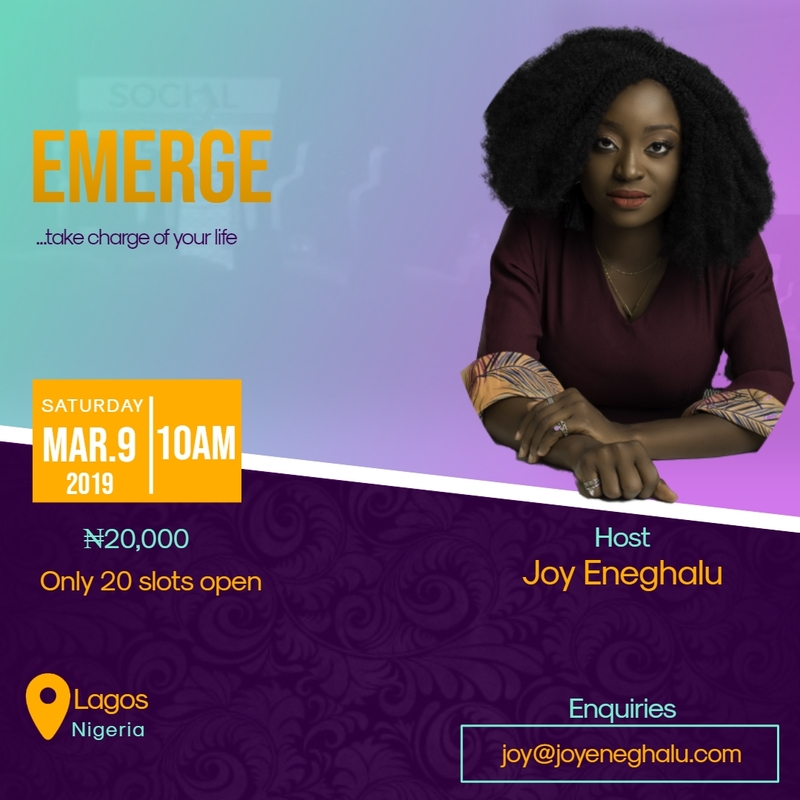 Emerge is a 6-hour session that will help you find your core message, go through goal setting and mind mapping, show you how to use social media increase your visibility, add some fun to your life (this will happen from your personality) and then action points to elevate you in no time. 1) This is for people who have no personal brand. 3) Those who think they have a personal brand and want to be visible to those that matter. Send a mail to joy@joyeneghalu.com with your name, phone number and email address. You will be sent a mail with a link to an exclusive WhatsApp group.